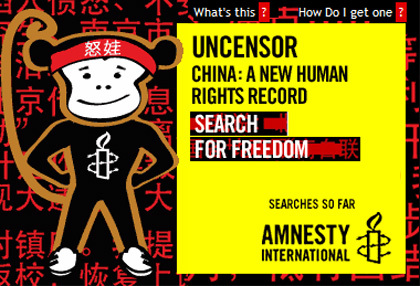 The Amnesty International Uncensor campaign states: Like the monkey in traditional Chinese culture, "Nu Wa", the Uncensor China campaign mascot, is strong-willed, cheeky, energetic, sporting and intelligent. Nu Wa means: outraged, angry young boy. Nu Wa's name creates an association with the "Fuwa", the five official mascots of the Beijing Olympics. Fuwa means "The Friendlies". Their overly happy and cute demeanor defies the worsening human rights situation inside China today. Nu Wa wants to set the record straight by speaking about the human rights abuses suffered by people in China. This page supports the Amnesty International Australia "Uncensor" campaign (now deleted), highlighting human rights abuses in China in the lead-up to the 2008 Beijing Olympics. The Amnesty "Uncensor" campaign website is now deleted, but we have left this page in place. It concludes with an opinion piece by author and journalist Antony Loewenstein, who was one of Amnesty's main supporters during the campaign period. Be part of Amnesty's direct action! The "image" on top of the page contains a "search box" with some predefined terms, such as "Tiananmen". If you do a search using this search box, a page of the Uncensor campaign website opens - but, more interestingly, inside that page a window with the Yahoo!-China search results (ie from the Yahoo! website in China) will show. This is a form of Direct Action by Amnesty International Australia: the more people do the search for the (censored by Yahoo!) pre-set search terms, the more Yahoo! is under pressure, because their customers (you!) want them to deliver, while at the same time their censorship of the Yahoo! search results is exposed. For example, if you do a search for one of the terms, SARS (the epidemic), the Chinese Yahoo! image search results show many good-looking chinese-made vehicles, deliberately misreading your search term SARS and returning a result for CARS ... but nothing about the epidemic! Nu Wa's favorite accessory, a red bandana, was worn by many during the Tiananmen Square crackdown in 1989. Gagged by his own bandana, Nu Wa symbolises the silencing of Chinese human rights defenders who are imprisoned or otherwise detained. Nu Wa's broken heart symbolises the grief and suffering of families and individuals affected by human rights abuse in China, and sadness that the Government is not enacting the reforms it has promised. Expressing your opinion in China can result in jail, torture or death. People are silenced and what happens in China is clouded in secrecy. Chat rooms monitored. Blogs deleted. Search results re-routed. Websites blocked. That's Internet censorship, China's 'Golden Shield Project'. The Government is watching you. Who is affected by internet censorship? Internet censorship affects everyone. Environmental activists, HIV lobbyists, human rights supporters, bloggers with opinions. These people and more are all denied freedom of expression in China. Each year China executes hundreds of people, more than any other single country. Among the victims are people like Nie Shubin, a young farmer, who was put to death for a murder to which someone else later confessed. Imagine being locked away for years, yet you've never been charged with a crime nor spoken to a lawyer - in China it happens to thousands of people every year. Human rights defenders aren't usually world leaders or global figures. Mostly they're ordinary people who're willing to stand up for what they believe is right. They can be journalists, healthcare workers, lawyers, grieving parents, they can be anyone. Experts believe China has the most extensive, technologically sophisticated and broad-reaching Internet filtering system in the world. The major overseas Internet companies operating there have, in one way or another, facilitated or colluded in the Government's censorship practices. China has made big promises about how the Olympics will improve human rights - now it's time to deliver. Should the Olympics be being held in China? Does the International Olympic Committee have a duty to help China improve its human rights record? China is the world's most populous country, and the Beijing Summer Olympic Games are a chance for it to showcase itself in the world spotlight. Expressing your opinion in China can result in jail, torture and death. Peaceful human rights defenders have had their phones tapped, homes raided, assets frozen and sometimes even their family and friends have been harassed. Some activists are tortured in secret detention centres, others are executed for vague crimes. It's hard to gauge the full extent of the persecution because of the secrecy that shrouds China. Amnesty International is focusing on a number of case studies. Read their stories. Antony Loewenstein is a Sydney-based journalist, blogger and author of the forthcoming book, The Blogging Revolution. He is a regular writer for the Uncensor campaign. Here are some of his articles about human rights in China. The Sichuan earthquake may have largely fallen off the Western media’s radar but the Chinese people remain focused on the disaster. A number of bloggers are proving that robust debate is increasingly possible, even for aggrieved parents whose children were killed. Many have been denied the chance to mourn their loss and challenge corrupt building practices in the courts. One cultural critic was even accused of “brown-nosing” the authorities. The rapid rise of NGOs and their services will not be quickly quashed. A growing number of Chinese citizens are demanding rights that were unimaginable barely a few months ago. Chinese soldiers have been brought in to fire missiles into boulders and clear the way for a channel to drain the precarious Tangjiashan lake, the bulging body of water in Sichuan province that threatens 1.3 million quake-affected people living downstream. Sadly, the International Federation of Journalists reports that the regime is again imposing draconian media conditions in the disaster zone after a period of relative openness. Old habits die hard. “For three days last month, China’s national flag flew at half-staff in Tiananmen Square to honour the victims of the devastating earthquake in Sichuan. It was the first time in memory that China has publicly commemorated the deaths of ordinary civilians. If Beijing is expecting a smoother PR ride in the months before August, it will be sorely disappointed. Mobile phones are becoming even more popular than the internet to spread news and views and the regime has no major techniques to manage it. Although few citizens are openly critical of the Games itself, it’s dismaying to read the support offered by the Bush administration for security. Washington has approved the export of “sensitive” equipment and expertise to the regime, despite the Export Administration Act specifically stating the illegality of doing so. Like America providing arms to Israel, America’s supposed concern for human rights always comes after the chance for corporations to make money. “The rule of law is still shaky in China, but Chinese environmental lawyers have filed and sometimes won suits on behalf of citizens who are sick because of pollution or whose farms have been poisoned. A former journalist named Ma Jun has created the remarkable online “China Water Pollution Map” for his Beijing-based group, the Institute of Public and Environmental Affairs. Anyone using the Internet can zoom in on a city or village, click on a lake or river, and see the latest pollution readings—and also which factories or farms are creating the problem. The issue of challenging state propaganda and media bias is central if China is to react less defensively when provoked by the West. Of course, Americans, Australians and Europeans are rarely better at hearing criticisms, either.